I bought a bag of dried shrimp at H-mart expressly for use in the carrot salad from Naomi Duguid's "Burma." A book I hope will be forthcoming from a certain family member this holiday season. Luckily, the Tipsy Baker posted the recipe here on her blog. If you like the Thai green papaya salad, you will love this recipe, and you won't have to source green papayas. 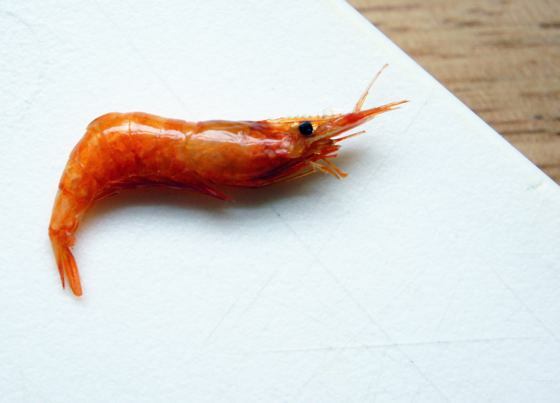 You will have to find some dried shrimp and grind them up in your food processor. Creepily, their little eyes remain intact after grinding. You can just tell people they are poppy seeds. They keep indefinitely in the refrigerator. You can also use them when you make kimchi. Sophie didn't even notice them in the salad. If you don't own a largish mortar and pestle you can just use a rolling pin or a muddler to pound your carrots. I scaled back the pepper by half because I used an extremely hot Thai chile pepper. It was just perfect for our family but almost too spicy for Sophie's friend. I added the fried shallots last minute because I didn't want them to get soggy so they aren't visible in the picture below. It was nice to eat something that didn't contain butter, flour, sugar or eggs after all the baking. After hearing Duguid's recent interview on the "Good Food" podcast, and tasting this salad I am even more excited to get my hands on this cookbook. I may break down and buy pre-fried shallots from the Vietnamese grocery. According to the Tipsy Baker, the shallot chopping and frying is a part time job when cooking from "Burma." We went to Hmart and Wegman's today and it was a total goat rodeo. I am hoping I don't have to go back to the grocery store before Christmas. Why is cheese so expensive? I bought a ham to supplement my Christmas brunch/dinner in case we don't have enough fondue. We found Chocolate Pirate's Booty which looks like dried dog turds. We finished the bag on the way home; it's that delicious. I swam a mile this morning so it doesn't really count anyway. We were in Hawaii this time last year, and I remember looking all over for Saffron James perfume for Maddy. This year I love the Bobby Brown fragrance, Beach. Maddy thinks it smells like sunscreen. To me it smells like our beach towels do after a weekend at the beach--sunscreen + salt + something undefineable. I keep sniffing my wrists and thinking of mai tais and sunsets. Dec 21 Who Will Be Our Life-Ring?